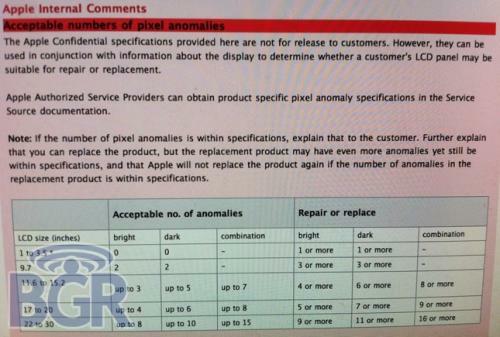 BGR has received a screenshot of a purported internal Apple support document outlining the company's policies regarding bad pixels on the displays of its products. According to the document, Apple allows for repair or replacement with as little as one light or dark pixel on the company's iPhone and iPod touch, moving up to as many 16 required as a minimum for repair or replacement on displays 22 inches and larger. Notably, Apple's policies do allow for some leeway to permit its support staff to offer customers repair or replacement with fewer anomalies than that listed as required. The customer is to be made aware, however, that his or her replacement device could have more anomalies than the product they are returning, and if the new product does not meet the documented threshold for replacement, a second exchange will not be permitted.